Find out more about Bell Stained Glass Company here! Wrought iron products for your home and church from one place! Wrought iron from Bell Stained Glass: Unbeatable Value and Quality! Wrought Iron gives you and your family the protection they deserve! Increase the curb appeal and value of your home with wrought iron products from BSG! 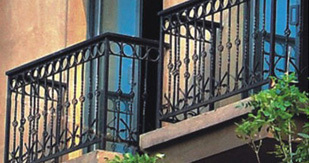 We get our wrought iron direct from the supplier. By doing this we cut out the middleman and pass the savings to YOU. Doors, Fences, Stairs, and more are now a possibility. We have no limits, CONTACT US today to find out more! Wrought Iron Doors from Bell Stained Glass give you and your family the safety they deserve, at a price lower than the competition! You work hard to provide for your family, protect that investment, and have peace of mind. -7 step blasting and coating process on the door finish alone! Wrought iron in unlimited choices! 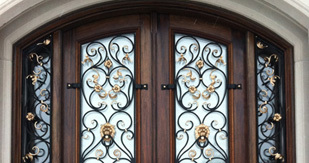 Bell Stained Glass welcomes custom wrought iron work. How much will wrought iron cost me? Wrought iron is a possibility for anyone with Bell Stained Glass, we cut out the middleman to save you money. Price depends on the complexity of the design, all you need to do is CONTACT US with your job specs and design pictures and we will be glad to provide a quote over the phone or in writing. Remember we will always give you a fair price, excellent service, and the highest quality product around. 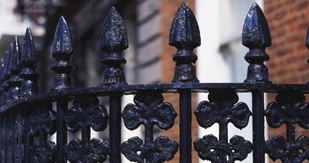 Why should I chose wrought iron for anything? Wrought iron from Bell Stained Glass is not only beautiful, but it is specially coated to last much longer than traditional wrought iron due to advancements in technology. The coating and finishing process is a seven step process alone and comes with a five year warranty. The prices are excellent too, at BSG we cut out the middle man since we order direct from the manufacturer, resulting in savings we pass along to you! I liked a design I saw elsewhere, can you get that for me? Bell Stained Glass works with experts in the field of CAD design, ensuring most everything can be made by us, from ornate church crosses, to elaborate doors, and window guards. Any size is available. If you have anything you'd like to inquire about, CONTACT US by phone or email us a picture and we will get right back to you. Custom autocad drawings will take a couple days to complete.